﻿The transformerless, Class‑A DI input circuit from Phoenix Audio's DRS2 two-channel mic preamp (reviewed by Hugh Robjohns in SOS February 2003) can pretty safely be described as very successful — not only has it been a fixture in Phoenix Audio's mic preamps ever since, but it has also spawned a range of dedicated active DI products, each with a slightly different feature set. The company's first stand‑alone DI was the entirely Class‑A, half-rack, two-channel Nice DI that featured a 10MΩ input impedance, the company's DSOP‑2 discrete Class‑A output amplifiers, and custom-wound DB694 output transformers. With only the two pairs of input and thru quarter-inch jacks and two output level controls on its front panel, the Nice DI's purist, minimalist appeal has endured down the years, and it has even found a niche as a stereo mix bus 'colour' processor. Next came a 500-series version in the form of the Pivot Tone Channel. Reviewed in SOS April 2017, this variant added a 10-LED ladder output level meter and a 'tilt' EQ control to balance the basic tonality of the source. The eight-channel N‑8, reviewed by Hugh in SOS October 2018, was the next DI derivative to appear, swapping out the Pivot Tone's tilt control and LED ladder for illuminated buttons controlling a -15dB pad, polarity reverse and earth-lift switching on each channel. 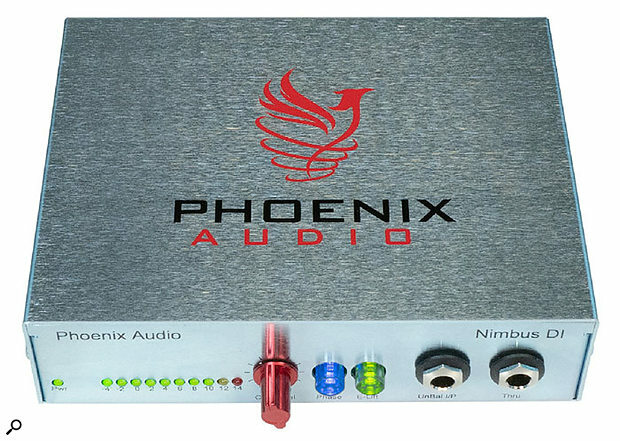 This potted history of Phoenix Audio's DI development brings us neatly to the latest in the line — the single-channel Nimbus DI, which combines the expected 10MΩ input impedance, Class‑A transformerless input stage, DSOP-2 output amplifier and DB694 transformer with the polarity and earth-lift buttons of the N‑8, along with the Pivot Tone Channel's 10-LED ladder meter. Since Hugh's detailed dissertation on the technical aspects of a single channel of the N‑8 will apply to the Nimbus DI, I'm going to refer you to that review (SOS October 2018) if you wish to explore that area further and, instead, focus on the more practical aspects of the new unit's performance. On the physical side, the Nimbus' external, universal‑voltage, 24V power supply is, as in the N‑8, equipped with both an IEC mains connector and — to my personal delight — a locking connector that mates with a multi-pin connector mounted on the rear panel. Other rear-panel connectors are the transformer-balanced output XLR and an unbalanced quarter-inch jack output. The front panel carries a small power LED, the horizontally-oriented LED meter, a strangely-elongated, red-anodised, Neve-ish output level knob, the blue-illuminated 'phase' (polarity) button, the green-lit earth‑lift button and two quarter-inch jacks for the unbalanced input and its thru output. One minor anomaly I immediately noticed is that the first green LED in the ladder meter is permanently lit, and it is identical in colour to the green power LED. Personally, I find that confusing for a couple of reasons: I want to see a different colour LED for power indication; and I don't want to see a meter segment lit when there's no signal present, unless that is the only front-panel indication that the unit is receiving power. As Hugh found in his tests and I did in mine — both with the Nimbus and the Ascent Two EQ I reviewed recently — the performance of the Phoenix Audio DI circuit is absolutely excellent. Phoenix Audio's approach of using the output amplifier, rather than the output transformer, to provide saturation and harmonic colour gives their DI devices the ability to go from pristine clarity to saturation, making them more than ideal partners not only for electric instruments, but also, with that 10MΩ input impedance, for piezo-equipped acoustic instruments. I'd also happily add a couple of Phoenix Audio Nimbus active DI boxes to my collection for those occasions when an instrument or mix needs that bit more character to make it stand out from the rest. The Nimbus isn't exactly cheap for a DI, but when you need it, it will be well worth the price.